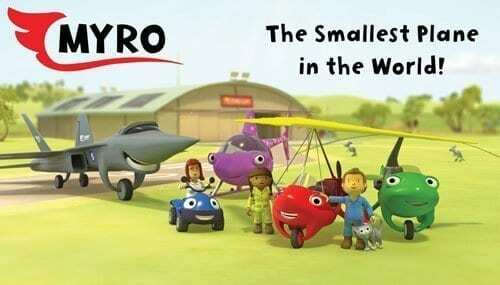 Myro is a cute little Microlight, created by the fantastic author Nick Rose, who happens to be the smallest plane in the world. The fact he is so small does not deter Myro from taking part in some great adventures. I am all for reading on my iPad, that is the main reason I purchased it however Liv has really amazed me with how quickly she has taken to it. She is still 3 and knows how to use an iPad! At her age I had a wooden, nodding dog on a piece of string with a spring for a tail! I am a huge fan of children using technology though, as the educational benefits far outweigh any negatives there may be. When given the chance to review Myro and the Jetfighter as a book app on the iPad, I was extremely curious to see how Liv would take to the app as we are huge book fans in our house! The app was incredibly easy to download through the iTunes store and was ready within a couple of minutes. The Myro and The Jetfighter app is fully interactive with the options of having the book narrated to you, simply reading the book by yourself and even the option to record yourself reading the book. Already I was highly impressed with how the app can help your child to read. To start with we naturally picked the narration option – the book is narrated by Christopher Biggins who’s voice appeals to both adults and children alike and I really cannot think of anyone better who could have put their voice to the great series of audio books and apps. One of my favourite features are the blue dots that appear on certain images on each page of the app when the dialogue has been read. Your child has the option to simply touch the corresponding dots to enable other sounds on the page such as birds singing or a double decker red bus sounding its horn. There is even a map icon on each page that allows you to see how Myro is progressing with his journey. A refresh button on each page also enables the dialogue to be read again, very helpful for your child’s memory, especially when they are learning to read. The graphics are adorable and really inkeeping with the story, the characters are colourful and very cheery which helps to engage your child with the story. The story ends and give your child the chance to partake in fun and games such as learning how to talk like a pilot, with the use of phonetics. Alongside the chance to have a play with the interactive Myro app, we were also sent the ‘Myro Arrives in Australia’ audio book. The book is just as colourful as the app and again follows Myro and his friends on an epic journey. The book comes with a CD, narrated by Christopher Biggins. There really is something for each child and with the stories following Myro in Australia, it gives the opportunity to learn about another country, with Australian phrases thrown in every so often! The book is of high quality, with a flip out back page which includes a Pilot’s Phonetic Alphabet, factfile on the images and characters found in the book, Myro’s Adventure Map and a rundown of the parts that make a Microlight. Myro Arrives in Australia is just one in a series of Myro audio books which can be purchased from Amazon, Waterstones and Independent booksellers. The app is available on the iPad via iTunes.